5MC ~~ Possible | Only at His Feet! I started this challenge just hoping to grow, to write better, and to think smarter. Reading and writing help you to do that. But…after reading some of the wonderful blogs in this October’s challenge, I wonder sometimes just where I fit in. I have seen elegant, beautiful posts. I have read posts full of comedy and laughter. Essays filled with emotion and meaning. Posts that take you to the heart of the person writing. Makes me think these people have been writing for ages or just have a great talent with words especially when it comes to this 5 minute challenge. I try my hardest but getting a ‘flow’ going in 5 minutes is a big challenge. To myself I sound like someone trying to write or speak in a different language. I sure do get a laugh at myself as I peck on the keyboard, waiting for my timer to go off while trying to make some sense. 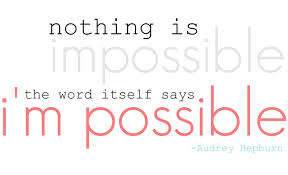 POSSIBLE… All things are possible! All you have to do is keep trying…keep pushing yourself. That’s one thing this challenge has taught me. Don’t give up!